Heathrow Airport (LHR IATA) is the main airport for London, the largest airport in the United Kingdom, and the second busiest in the world in terms of international passenger traffic. It is located in the west of London, 17 miles (27 km) from central London. It is the primary hub for the UK's national carrier, British Airways, and for the airline founded by Richard Branson, Virgin Atlantic. London Heathrow is a giant, sprawling airport divided into four passenger terminals (numbered 2, 3, 4 and 5). It was established in the late 1940s, and is London's primary airport and the premier air gateway into the United Kingdom. It is also the second busiest airport in the world for international passenger traffic and Europe's foremost hub airport. Due to its size, increased security requirements and the fact that development had not kept pace with its growth, Heathrow has became overcrowded and has developed a reputation for long queues, inefficiency and delays. It has only two runways although its traffic is more typical of airports with four or more, so delays are common, particularly during inclement weather. Terminal 2 was rebuilt as "The Queen's Terminal", and opened in June 2014. Terminal 1 closed permanently in June 2015 and its operations were absorbed into Terminal 2. Heathrow does not have good snow clearing facilities, and the airport often has to be shut down during snowstorms in the winter. As the most well-known airport in the UK, Heathrow appears in a large number of films, but rarely in a starring role. Heathrow: Britain's Busiest Airport (ITV, 2015). Documentary series about the complex day-to-day operation of the airport, including areas you may not think of like the wittily-named ARC (Animal Reception Center). A long, drawn out game of musical terminals is being played by the airlines at Heathrow: British Airways is gradually moving all of its flights to Terminals 5 and 3. While British Airways is doing this, the other airlines are moving round to better use the space that has been vacated. Eventually, all of the airline alliances (Oneworld, Star Alliance and SkyTeam) are to have their own terminal which their members use, thus minimising the number of connecting passengers who have to change terminals. Make sure you double check which terminal you need to use on the Heathrow Airport website as the situation changes frequently! The airport is some 17 miles (27 km) west of central London. A large part of the journey can be made by means of the M4 motorway, which can, however, be quite congested at peak periods. Terminal 5 can be reached directly from junction 14 of the M25. The airport is also near the M40 and M3. The car rental depots are all concentrated along the northern periphery of the airport, and free shuttle buses are available from all terminals. There can be time delays when arriving at the hire desk with large queues so make every effort to get to the desk before the crowd, perhaps by getting one member of the party with hand luggage to go straight through. You may find at early morning or late evening that the arrivals hall desk is closed and you have to go straight onto the shuttle bus and check out your rental at the depot instead. If you are intending to drive into the centre of London you will be liable for the Congestion Charge, which is £11.50 per day and applies on Monday-Friday 7AM-6PM. Automatic number plate recognition cameras are in operation, and your car rental company will track you down and bill you with the hefty fine if you fail to pay. Different car parks have different procedures. There is no shortage of choice when parking your car at Heathrow but there are many procedures to follow depending on which car park you choose. Some simply get you to turn up and report to a reception area which is easy enough. However some others have different procedures such as using the credit card you used to pre book with to enter the car park or even registration plate recognition. There is also a massive difference in the prices charged by many car parks in and around Heathrow. For example, you can find individual house owners in the vicinity of the airport who are happy to rent you a space outside their house for a week or two and it’s usually very cheap in comparison to the large car park operators; however, this is definitely a case of "buyer beware"! Of course, there is no security at these spaces – you get what you pay for to some extent – plus you often find that you are left to your own devices to get to the airport. This could mean public transport if you’re lucky, but more often than not, it means getting a taxi both there and back. This usually results in negating any of the cost savings you have made in the parking itself. All the terminals have very good public transport links to and from central London, with options ranging from local and express buses to the London Underground and rail services. The majority of travellers heading to central London use public transport as it the easiest way to go. Note that there are different rail stations for the five terminals at Heathrow - be sure you take the right train as not all trains go to the same terminals. You can usually check the front of the train or listen to the onboard announcements for an idea of where the train is going. Heathrow Express. 05:33-23:48 (Terminals 2 & 3) - peak times 06:30-09:30 and 16:00-19:00. The fastest way to central London from Terminals 3 & 5 is the Heathrow Express rail service, but it is also by far the most expensive. The train departs from Terminal 5 every 15 minutes, stops at Terminal 3 and then runs non-stop to London Paddington, Central London, where connections are available to the rest of London’s transport system. It does not operate directly to Terminal 4; you must take a connecting (TFL Rail) train to Terminals 3 and change - cross platform - to the Express. Journey time from Terminal 5 to London Paddington is 21 minutes, and from Terminals 1 & 3 it’s 15 minutes. The trains are air-conditioned, modern, comfortable and are fully accessible with a wheelchair area, disabled toilet and level access to the station platforms. Free Wi-Fi Internet access is available on board. Mobile phone coverage is available throughout the entire route, including in the tunnels under Heathrow. On board TV entertainment plays throughout the journey, offering BBC News bulletins, destination information, comedy clips and trivia. Quiet zones are available where this does not play. There are two classes of accommodation - Express (Standard) Class and First Class. First Class offers a larger seat, more legroom (though there’s plenty in Express Class), tables and complimentary newspapers. The First Class area of the train also stops closer to the station exits. Since the journey is only about 15 minutes long either way, the First Class area is something of a real luxury and really only for those with money to burn. Fares can be purchased in advance on the internet, from the station or on board the train and they vary in price depending on where you bought them. National Railcard discounts are available at Heathrow Express station ticket offices only (with the exception of Disabled Persons Railcard, which can be used on-board). Child fares (5–15 years inclusive) are about half the adult fare. Under 5s travel free. If you book your ticket online you can have it sent to you as an email message to print out or as a mobile phone picture message, both contain a barcode and the conductor scans this on the train. TfL Rail (Direct from Terminals 2 & 3, and via a connection from T4 and T5). 05:29-23:30 (Terminals 2 & 3). It follows the same route to London Paddington as the Heathrow Express but is a slower, less frequent train which also serves intermediate local stations in West London. It’s cheaper than the Heathrow Express and it serves Terminal 4 directly, but passengers needing to get to Terminal 5 have to change to a connecting service at Terminal 3. TfL Rail provides a convenient connection to London Underground’s Central Line at Ealing Broadway station. Trains depart Terminal 2,3 for London Paddington every 30 minutes, stops: Hayes & Harlington, Southall, Hanwell, West Ealing and Ealing Broadway. Journey time from Terminal 3 to London Paddington is 28min. From December 2019, trains will continue into central London after stopping at Paddington, serving stations in the West End, City of London, Canary Wharf and North-East London. The trains are air-conditioned, modern and accessible with a wheelchair area and disabled toilet. Although Heathrow and London Paddington stations have step free access, be aware that not all intermediate stations are wheelchair accessible (although TfL are working to ensure that all stations on the route will be step-free to platform level by December 2019). Audio and visual journey information is provided on board. Mobile phone coverage is available throughout the route, including in the tunnels under Heathrow. This service is the former Heathrow Connect train and is now operated by Transport for London. From Autumn 2019 the route will be extended into Central London and beyond when it becomes the Elizabeth Line (Crossrail). SouthWest Trains (Bus link from Terminals 2 & 3, bus 285, and Terminals 4 & 5, bus 490, to Feltham railway station.). Trains every 20 minutes. Although a slower route, if you are heading for south London or the west London suburbs, Richmond or Windsor, this could prove a useful shortcut. 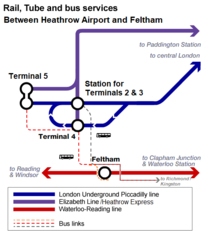 Regular bus services run from the airport to Feltham station (single fare £1.30 on Oyster) and a frequent east-west rail line runs between Reading and London Waterloo (single fare £5). Depending on the route, some trains take 30 minutes (trains via Richmond), others take 45 minutes (trains via Hounslow and Kew), so it is advised to check the train times carefully if you are rushing to catch a plane. You must buy your train ticket before boarding as this is not an airport express train but a standard suburban rail service. You can use Oyster cards valid for zone 6 to use the train and bus on this route. London Underground’s Piccadilly line direct to central London. Up to every 5 minutes (dependent on terminal). Oyster cards are valid. The tube entrance is poorly signposted and actually on the opposite site of the terminal from the train entrance. At the train entrance you will not find anything, neither tickets nor wagons for the tube. The Piccadilly line runs direct from all the terminals to the very centre of London, stopping at stations close to many of London’s landmarks, shopping and entertainment areas, as well as the major transport hub at King’s Cross St. Pancras. However, the small, cramped Tube carriages have no luggage space to speak of and many central London stations that are deep underground have yet to install step-free access, making the Piccadilly line far from ideal for travellers with lots of luggage. The line also has a large number of stops and is comparatively slow (60 minutes from Terminal 5 to King’s Cross St. Pancras at the far end of central London, vs 45 minutes using the Heathrow Express and changing to the Tube at Paddington). Nonetheless, it is an integral part of Transport for London’s network so Travelcards, Oyster cards, and Contactless credit or debit cards are valid, making it a good value option. It’s also a better option if you want to get to much of west London instead of having to go into Paddington and then back out again. Trains depart Terminals 4 & 5 every 10 minutes and stop at Terminals 2 & 3 before continuing to London, thus making the frequency from Terminals 2 & 3 every 5 minutes. Trains to and from Terminal 5 do not stop at Terminal 4 and trains to and from Terminal 4 do not stop at Terminal 5. Be aware that if you are heading from central London to Terminals 2 & 3 then it is normally quicker to wait for a train which terminates at Terminal 5 as the trains to Terminal 4 wait there for up to 7 minutes before continuing to Terminals 2 & 3. Terminal 5 trains go directly to Terminals 1 & 3 first, then continue to Terminal 5. The Tube closes during the night for maintenance work and the first trains leave Heathrow at about 06:00. Last trains are around 00:00, but check beforehand! Be aware that during peak rush hour periods the Tube becomes extremely overcrowded, particularly in the central zones. Trains designated for Heathrow are sometimes rerouted down the Rayners Lane branch or terminate short at Acton Town or Northfields to deal with peak-hour congestion - the driver will normally make an announcement if this is going to happen. If you are using the Tube to travel to Heathrow during rush hour, ensure that you leave central London in plenty of time. Also, try to join the train as far up the line as possible - King's Cross St Pancras is a good bet - since you will stand a much better chance of finding a seat and somewhere to put your luggage. Also, if you are going to T4 or T5 and a train to the other terminal comes along and it looks like it has space, it can be a good bet to get on that train, then get off at Hatton Cross station (just before Heathrow) and wait until the right train comes along, since in central London the train you actually want may be very crowded. As the Tube is a rapid transport system designed with short journeys in mind, the trains are not as comfortable as a mainline train. However, from Heathrow there will almost always be seats available and luggage space is provided. There is space for wheelchairs and the Heathrow stations are accessible, but as the first parts of the Tube system were built in the 19th century, very few stations in central London are accessible to wheelchairs. Almost all involve negotiating staircases and escalators. Earls Court is an exception and some other stations can be reached by wheelchair users by changing to alternative lines here. More stations are being adapted (King’s Cross St. Pancras is now accessible, for instance) and accessible stations are shown on the Tube Map available on TfL’s website  . Audio and visual journey information is usually provided on board. Travelcards (day, or period tickets which allow unlimited travel on all of London’s public transport, not just the Tube) are available and will almost certainly provide better value if you plan on using London’s transport system more than a couple of times. The cheapest option for anyone spending a longer time in London will probably be to get an Oyster card (a Transport for London travel smartcard) or to use a Contactless credit or debit card, which is always cheaper and easier than paying fares in cash. However, the Oyster card can only be returned (including getting back your deposit) after 25 hr or more of purchase. Also, your card amount is not allowed to be above £10, otherwise you need to register online to return the card. See the London article and Transport for London’s website for more information on Oyster cards and other available fares. Day time local buses to the areas surrounding Heathrow. In the day time there are no local bus services to central London (that service is provided by the Tube), but there are plenty of services to areas of west London and outlying towns such as Slough and Maidenhead. Heathrow Airport have a map and journey planners on their website showing the routes available. Fares vary depending on the operator, but Transport for London services (red buses) are subject to the standard flat fare when paying by cash (Travelcards and Oyster Cards are also valid on these buses). If you really want to go by local bus during the day from central London (perhaps you have a bus pass not valid on trains or coaches), expect a journey time of about three hours, depending on exactly where you start from. If you're intrepid, use the TfL journey planner  to find details, times and (most importantly) where to change buses, which you may end up doing three or four times depending on where you start from and when you travel. N9 Regular late night London Bus Service. During the night, when most of the rail and coach links (and the flights!) have stopped operating, one of the few ways you can get to and from Heathrow is by using the N9 night bus service, which operates to and from Aldwych in central London via Hammersmith. The service runs every 20 minutes on weeknights and takes around 1 hour and 10 minutes to Heathrow Central Bus Station and continues to Terminal 5. The service is operated using modern, accessible, low-floor busses with a wheelchair space. The N9 is a normal Transport for London Night Bus service and so is subject to a flat cash fare of £2.00. All Travelcards and Oyster Cards are valid on London Bus services. Black cabs - London’s famous black taxis - are available for hire outside each terminal. Journey time into Central London varies wildly depending on distance, time of day and traffic conditions. It can take anything from 40 minutes to 2 hours. Fares vary similarly, as a rough guide it could cost about £55 to Central London. Minicabs (private hire cars) must be ordered in advance by phone (or internet in some cases) and usually cost less than a black cab. Never take a minicab if you haven't pre-booked it, because then it's just a stranger's car! Here are some private hire companies that that can be pre booked online: Addison Lee, Green Tomato Cars, Majestic Taxis & Chauffeur Driven Cars, Black Lane. All these companies provide a meet & greet service, their drivers will meet you in the arrivals area of the relevant terminal with a sign displaying your name. If you are thinking of taking a taxi into London then consider the Heathrow Express (you can pick up a taxi at Paddington station to complete your journey). They will probably be faster and cheaper, and almost as easy to use. One significant benefit of National Express' service is that they have a generous luggage allowance, dedicated holds for the same on their coaches and direct routes from all three terminals, meaning that while NatEx may be slower than the train (often by hours) it is also significantly less hassle and usually a lot cheaper into the bargain - especially if booked in advance. You are also guaranteed a seat, as unlike rail (where unlimited tickets can be sold for a given journey and you may be expected to stand if you can't find an open seat) National Express will not sell more tickets than they have seats available, and these seats are usually comfortable and relatively roomy. Given that rail journeys will often involve multiple changes onto services that may have limited luggage storage space, and journeys on the London Underground, which is often absolutely ram packed and has absolutely no luggage storage whatsoever, this makes National Express arguably the easiest and most comfortable means of getting to Heathrow from around the country with anything other than a carry-on bag. The downside is that the coaches run, obviously, on normal roads and will stop at any number of small towns on the way to their final destinations - any delay (particularly on the notoriously traffic jam-prone M25 orbital motorway around London) can therefore be catastrophic if you have a tight connection, and the journey will be a lot slower and more circuitous than any on rail. National Express also offer limited to no compensation in the event of delays (whereas the railways have a regulated delay repay scheme and a legal duty of care to get you to your destination no matter what, even by taxi if need be - albeit not in any particular timescale) and their customer service is often dubious at best. Additionally, while some National Express services stop at well-lit, staffed and pleasant central bus stations or even dedicated coach terminals (e.g. Norwich's modern central bus station or Southampton's dedicated National Express terminal in the city centre), many if not most pick up and drop off points will be at normal roadside municipal bus stops which may or may not have seating or even a shelter, and will have no direct contact point with National Express if anything goes wrong. This compares unfavourably to rail, where stations almost invariably are well lit, have seating, have shelters (if not heated and lit waiting rooms), often have manned ticket offices to provide assistance and are covered by CCTV. Wikivoyage has a guide to Rail travel in the United Kingdom. Heathrow does not yet have any direct rail services to anywhere outside of London, meaning that you will have to go into the centre of the city and then come back out again, but making a connection in one of the central London railway stations is fairly easy. Through tickets are available to & from Heathrow Airport from any station in the UK, using either the Tube network, Heathrow Express or Connect from central London or the RailAir coach links. If you want to use the Heathrow Express it’ll probably be cheaper to buy your ticket for it separately. Make sure you specify the method you want to use to reach Heathrow when you buy your rail ticket. Paddington: (by Heathrow Express and Heathrow Connect) For Oxford, Bath, Bristol, Penzance, Cardiff, Swansea and the overnight sleeper to Cornwall. Euston: (Tube - Circle Line: Euston Square then walk 200m) For Birmingham (New Street), Manchester, Liverpool, the Lake District, Glasgow and overnight sleepers to Scotland. Liverpool Street (Tube - Circle Line) For Cambridge, Stansted Airport, Norwich and the Essex coast. Marylebone: (Tube - Bakerloo line) For Birmingham (Snow Hill) - slower than the main route from Euston but can be cheaper. King's Cross: (Tube - Circle Line) For Cambridge, York, Leeds, Newcastle, Edinburgh, and daytime trains to Inverness, Dundee and Aberdeen. Victoria (Tube - Circle Line) For Brighton and Gatwick Airport. If you plan on travelling on the Great Western line to the South West of England or South Wales then another option is to take the local U3 bus from the Central Bus Station to West Drayton railway station. The bus takes around 20 minutes to complete this journey when there is no traffic. From there take a local train to Reading railway station in order to connect to other services. The benefit of this route is that you are buying a normal railway ticket, as opposed to one that has a premium attached for a journey starting or ending at Heathrow. For information, time and fares for trains to & from Heathrow Airport check the National Rail Enquires website. See By coach sub-section for connections via coach services. There are many airport transfer services that provide personal transport services to Heathrow Airport. All transport companies that operate transfer services must be licensed with the relevant local authority. Drivers are issued a badge after undergoing various checks and vehicles are issued licenses confirming that they have passed rigorous safety checks and have the correct insurance in place. Drivers and vehicles are licensed as either Hackney Carriages or Private Hire, each one is covered by different regulations. When booking an airport transfer you should always check that the company has a license from the council. This is particularly important when booking over the internet or over the phone. Booking directly with a taxi company rather than with an online booking agency will usually be more cost effective. Terminals 2 & 3, as well as the Central Bus Station are all in the Central Terminal Area and are within walking distance, linked by underground tunnels with travelators. The Central Terminal Area is in the middle of the airport between the runways, Terminal 4 is in the south-eastern corner of the airport, beyond the southern runway and Terminal 5 is in the far west of the airport, between the runways. To get from the Central Terminal Area to Terminal 4 you can take the free shuttle train (every 15 min journey ~20 min) or tube (free only with Oyster card). To get from the Central Terminal Area to Terminal 5 you can take the free Heathrow Express train (every 15 min journey ~20 min) or tube (free only with Oyster card). To transfer between Terminal 4 & 5 there is either buses (#482 or #490) (journey ~20 min) or you can take the train to the Central Terminal Area and change. If you are connecting to another flight airside there is a network of free buses that will take you between terminals (if you need to change terminal). It's always good to have a little extra time when transferring from one flight to another, and this is true especially in a place like Heathrow. On a really busy day or during inclement weather your plane may not be allowed to land at its scheduled time, therefore two or three hours is certainly not "too much" time, especially if your next flight departs from another terminal. Heathrow encourages its passengers to wait near the restaurants, shops, and duty free areas by deliberately waiting to announce gate assignments until 60-90 minutes before flights depart. Pay attention to announcements and keep an eye on the time, lest you miss your flight. None of the terminals have a viewing gallery that is accessible from landside, but the Heathrow Academy on the Northern Perimeter Road has a viewing deck which gives good views of the northern runway (27R/9L). It is adjacent to the Renaissance Hotel, and the buses within the airport campus (numbers 105, 111, 140 and 235) stop at the deck. Hatton Cross tube station is also a good spot for viewing the end of the runways, depending on what time of day the aircraft are landing or departing. There are restaurants and fast food outlets in the departure areas of all five terminals, though, like most airports, the food can be overpriced. Boots, 06:00-22:00, sell a limited range of pre-packed sandwiches, salads and bottled drinks at a very good price. Located in departures, both before and after security, and in the arrivals hall. Costa, 24 hours, serves fresh coffee, tea, hot drinks, sandwiches and pastries. Located in departures, before security. O'Neills, 06:00 until last flight. An Irish bar, which sells a range of reasonably priced pub meals with your pint of Guinness. Located after security. AMT Coffee, 24 hours. A coffee shop which also serves a range of snacks. Located in the arrivals hall. Marks & Spencer Simply Food, 06:00 - 22:00, sell a large range of pre-packed sandwiches, salads, cakes pastries and bottled drinks. Not cheap, but good quality and value, after all - it's not just food! Located in the arrivals hall. Garfunkel's, 06:00 - 23:00, serves a range of British and American food including decent breakfasts. Located in departures, before security. Eat., 05:00 - 21:00, serve fresh, simple, seasonal sandwiches, soup, salad and cakes, bottled drinks and tea & fresh coffee to eat in or take away. Located after security. Brasserie Chez Gérard, 07:00 until last flight, serves a range French food and drink in a casual atmosphere. Located after security. Caviar House & Prunier Seafood Bar, 07:00 - 21:00, serves caviar, smoked salmon and seafood. Located after security. Boots, 06:00 - 22:00, sell a limited range of pre-packed sandwiches, salads and bottled drinks at a very good price. Located in departures, both before and after security. Costa, 05:30 until last flight, serves fresh coffee, tea, hot drinks, sandwiches and pastries. Located after security. Pret (After security turn left and walk to the gates at the end.). British chain of sandwich shops. £2+. Caviar House & Prunier Seafood Bar, 08:00 - 20:00, serves caviar, smoked salmon and seafood. Located after security. Boots, 06:00 until last flight, sell a limited range of pre-packed sandwiches, salads and bottled drinks at a very good price. Located in departures, both before and after security. Costa, 24 hours, serves fresh coffee, tea, hot drinks, sandwiches and pastries. Located in the middle of the arrivals concourse. The Crown Rivers (After Security). 04:30-22:30. Wetherspoons pub. Wetherspoon Express (B Gates, After Security). 05:15-22:15. Wetherspoons pub. Caffe Nero, 05:30 until last flight, serves fresh coffee, tea, hot drinks and Italian style sandwiches and pastries. Located on the departures level in the north of the check-in area. Has great views of the northern runway. Marks & Spencer Simply Food, 05:30 until last flight, sell a large range of pre-packed, sandwiches, salads, cakes pastries and bottled drinks. Not cheap, but good quality and value, after all - it's not just food! Located on the arrivals concourse. Giraffe, 05:30 until last flight, an alternative restaurant with a very up beat atmosphere and style. Serves food from around the world, including cooked breakfasts, curry dishes, pizza, sandwiches, fish and chips, salads, burgers, grilled steak and everything else they've got. Prices aren't too expensive. Located after security. Eat., 05:30 until last flight, serve fresh, simple, seasonal sandwiches, soup, salad and cakes, bottled drinks and tea & fresh coffee to eat in or take away. Located after security. Gordon Ramsay Plane Food, 05:30 until last flight. An airport restaurant from the 3 michelin star celebrity chef based on the Boxwood Cafe. Breakfast menu is available until 11:00. Serves a range of fine food tailored toward to needs of airport customers, example dishes include "Foie gras and chicken liver parfait, celeriac remoulade, toasted country bread" as a starter, "Escalope of veal, lemon, capers and a nut brown butter" main and "Valhrona chocolate fondue with banana, marshmallows and waffle" dessert. Casual dress code. Not cheap. Located on the south side of the terminal after security. Huxleys, 05:30 until last flight, serves great traditional British food and drink, including afternoon tea. Located after security. Caviar House & Prunier Seafood Bar, 05:30 until last flight, serves caviar, smoked salmon and seafood. Located in T5 and T5B, after security. Amongst its other attributes as an excellent orienteering course and exercise facility, Heathrow is also something of a haven for shoppers with branches of shops from the British high-street and beyond, including the London icons Harrods and Hamleys. Free WiFI is widely available in the airport. Connect to _Heathrow Wi-Fi. Paid upgrades are available for a faster connection. There are some USB power sockets and some mains sockets (UK sockets and a few European ones) in the lounge areas, but these are heavily used. There are also a few internet terminals for those who don't have their own device. Showers are available to travellers in both Terminals 3 and 4, and in the airline lounges in each terminal. Every terminal has at least one pay-to-enter lounge that doesn't require airline status or membership. Multi-faith prayers rooms exist in each Heathrow terminal and the airport has its own Christian, interdenominational chapel located landside. There are three hotels located within airport grounds; 2 full-service hotels and 1 budget hotel. 51.4734186-0.491463599999971 Sofitel London Heathrow, ☎ +44 2087 577777, fax: +44 2087 577701, e-mail: guestrelations1@sofitelheathrow.com. Check-in: 2pm, check-out: 12pm. 5-star hotel located next to Terminal 5. 51.45888-0.441411000000022 Hilton London Heathrow Airport, ☎ +44 2087 597755, fax: +44-2087 597579, e-mail: info.heathrow@hilton.com. Check-in: 3pm, check-out: 12pm. 4-star hotel located next to Terminal 4. 51.4595731-0.446489499999983 YOTEL, ☎ +44 2071 001100, e-mail: customer@yotel.com. Budget hotel located within Terminal 4, inspired by Japanese capsule hotels. Room rates are calculated on a per hour basis. There are also several other options in the area near Heathrow. 51.450267-0.5730864 Beaumont Estate, Burfield Road, ☎ +44 1793 819000, fax: +44 1753 640100, e-mail: beaumont@principal-hayley.com. Check-in: 3pm, check-out: 11am. 6 miles from the Heathrow Airport. It originated as a family home from the 14th century, and is made up of several buildings - including an old school house and an iconic white mansion – featuring ornate architecture like grand white exterior pillars, barrel-vaulted ceilings and stained glass windows. It provides 2 on-site restaurants and bars, a gym and pool. £84.00+. 51.4995029-0.454253399999975 Crowne Plaza London Heathrow, Stockley Rd, West Drayton, ☎ +44 871 942 9140. The hotel near Heathrow Airport has a number of facilities including a restaurant, bar and health club. 51.4942515-0.455800100000036 Holiday Inn London Heathrow, Sipson Road, West Drayton, ☎ +44 871 942 9095. Near to both London Heathrow Airport and the M4. It also provides airport parking and business facilities. 51.4823798-0.450463000000018 Park Inn Hotel Heathrow, Bath Rd, Middlesex, ☎ +44 20 8759-6611, e-mail: info.heathrow@rezidorparkinn.com. Modern hotel with 895 rooms and a shuttle service to Heathrow Airport. London is the obvious destination for the traveller trapped in Heathrow. With hundreds of years of history and a cosmopolitan and exhilarating culture, one can never be bored in the metropolis! Windsor and Eton (for Windsor Castle) are also a short cab ride away, if you would prefer a more sedate option. This huge airport travel guide to Heathrow Airport has guide status. It has a variety of good, quality information including flights, ground transport, restaurants, arrival and departure info. Please contribute and help us make it a star! This travel guide page was last edited at 22:53, on 14 April 2019 by Wikivoyage user ThunderingTyphoons!. Based on work by Wikivoyage users Ceever, Bigpeteb, Traveler100bot, Inferno986return, SelfieCity, ShakespeareFan00 and Billinghurst, Wikivoyage anonymous users 5.150.100.128 and 183.82.179.140 and others.